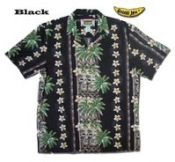 Banana Jack Hawaiian shirts are locally hand-made with quality fabric. A must-have for both locals and visitors to the Hawaiian Islands. Since as far back as the 1920's, our Aloha shirts have always conveyed a state of happiness and relaxation to those who wear them. 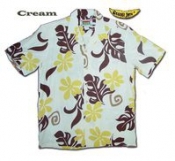 We have a collection of over 80 varieties of Mens Hawaiian Shirts for all shapes and sizes, and in a variety of fabrics and designs. Aloha! Banana Jack’s Hawaiian shirts are made right in Honolulu, Hawaii. Don’t be fooled by imitators, locally made shirts, stitched together from quality fabrics will look better, feel more comfortable, and last longer than low-quality alternatives. When you’re sipping your cocktail under the tropical sun, you’ll be glad your shirt is breathable and comfy, and you’ll look great too. There’s a reason the Hawaiians have become known for this style – the vibrant colors and prints reflect a bright and creative culture, and the supreme construction reflects the need for quality materials to put up with the tropical heat. At BananaJack, we’re proud to bring those qualities to the masses. Our Hawaiian shirts can fit in at a wide variety of events. From casual barbecues, to tropical destination weddings, company picnics, and everything in between, our amazingly comfortable Aloha shirts are the perfect attire for your warm weather occasion. After years and years of hand-crafting these popular shirts, we’ve developed an amazing selection of colors and prints. We have prints with traditional orchids and palms, as well totally unique designs like WWII aircraft, Alaskan sled dogs, and Mardi Gras icons. Our products ship via either USPS or Fed-EX. Allow 5-8 days for standard USA shipping, with expedited (3-4 day) options available. For details on our returns and exchanges, check our shipping policy page here. We’ve built our business off creating quality products and delivering them promptly and professionally. Our dedicated team of customer service reps will ensure your order is intact and on time.